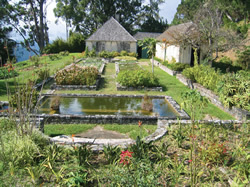 At an altitude of between 4,500 and 5,500 ft. in the hills of St. Andrew is Cinchona Botanical Gardens. Established in 1868, Cinchona is the only garden of its type in the Caribbean. In its early years, Allen Eyre commented that only the slopes of the Volcan Chiriqui of Panama offers anything comparable for majestic loveliness. From Cinchona one gets a majestic view of Strawberry Hill, the Blue Mountains, Liguanea plains, and Kingston. Forty acres of Cinchona was planted with Asian Tea and there was also a garden of European crops. At present, there are plans to revitalize the Garden.